Fangirls, this comic is too much fun. 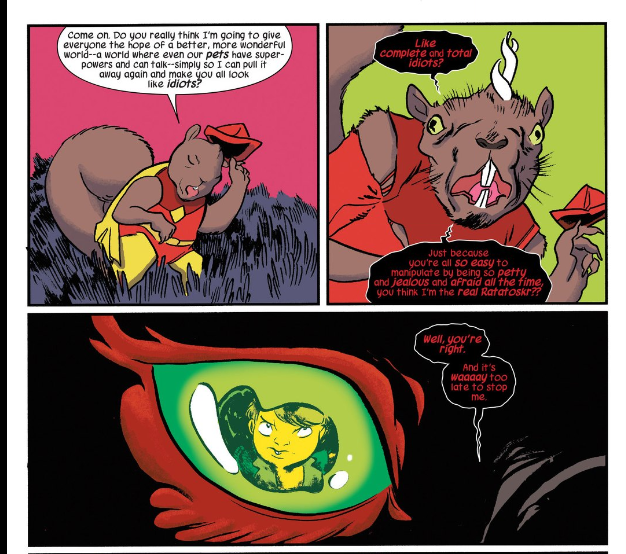 It’s a phenomenal way to showcase Squirrel Girl, and the importance of friendship. In issue 6, SG and Nancy find out that there are a couple other folks on campus who can talk to animals. 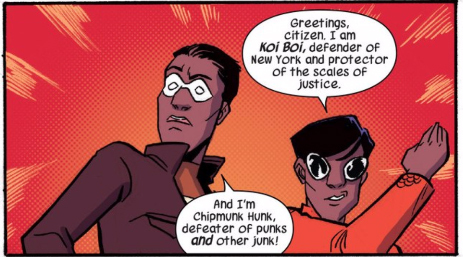 Chipmunk Hunk is Thomas, the gent that Doreen has slowly been developing a crush on, and Koi Boi is a kid in one of their classes. The four do some bonding and teaming up, it’s rad. Since Nancy is feeling left out, with her lack of animal conversation, she and Doreen go to the zoo to talk at animals, and hope that one of them gets it. But when an attendant has some sort of medical emergency, some lions get out. As SG is about to come to the rescue, Girl Squirrel hops in. And her fame takes off immediately. 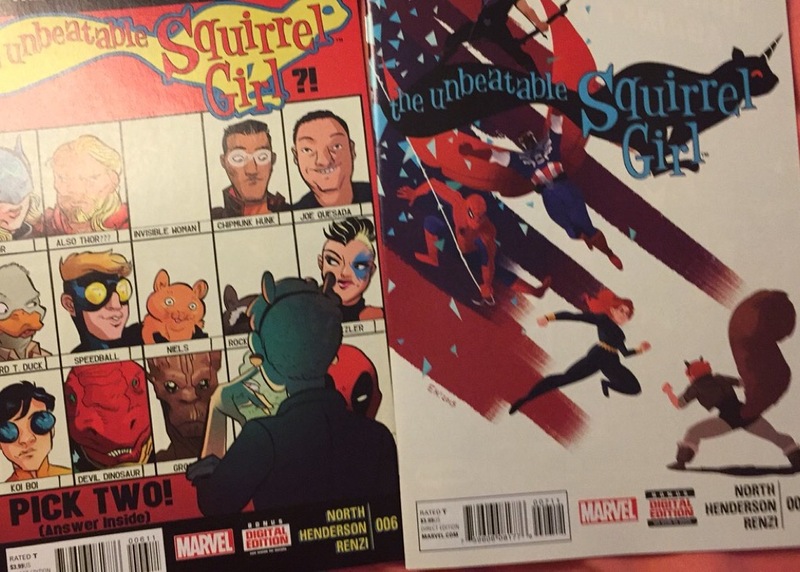 Girl Squirrel merchandise is all over the place, and she even steals Squirrel Girl’s shtick (kicks butts / eats nuts). The next day (and issue), fights are breaking out all over the city, even in class. The group of four does some research and has an idea; what if Girl Squirrel is actually Ratatoskr, a troublemaker from the same neck of the nine realms as Thor. The team heads to Avenger Tower, only to find that Thor isn’t there with them, and the Avengers are arguing over stuff. SG knocks them out, calls Thor from Cap’s phone, and goes to the diner where both Thor’s are taking care over a debate-turned-fight over the best breakfast food. After some discussion, Koi Boi, Chipmunk Hunk, and Squirrel Girl stay on Earth in hopes of catching / stopping Ratatoskr, while Nancy goes with the Thors to Asgard to rebuild Ratatoskr’s cage. The rhyming group finds Ratatoskr, who reveals herself to them in her true form, and then proceeds to kick their butts. It’s kind of scary. The conclusion will be in issue 8. I feel like rolling around yelling “IT’S SO GOOD!” isn’t enough, but really, that’s what I want to do. This comic is amazingly written and illustrated. Just go read it.